Our hospital recently became a level III trauma center. Across town, the larger tertiary care Ohio State University hospital is a level I trauma center. In total, in Columbus, we have two level I trauma centers, two level II centers, one level III center and one pediatric level I center. So what is the difference between them? There are 5 levels of trauma centers: I, II, III, IV, and V. In addition, there is a separate set of criteria for pediatric level I & II trauma centers. The trauma center levels are determined by the kinds of trauma resources available at the hospital and the number of trauma patients admitted each year. The level of a trauma center is determined by the verification status of the hospital by the American College of Surgeons. This post will focus on levels I, II, and III trauma centers (non-pediatric). 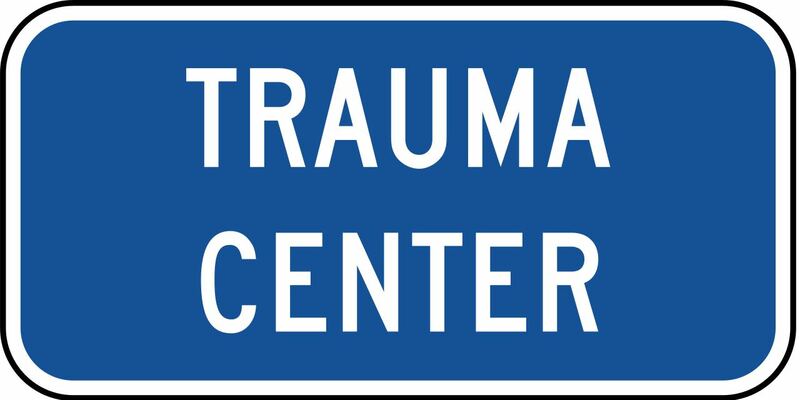 A level I trauma center provides the most comprehensive trauma care. There must be a trauma/general surgeon in the hospital 24-hours a day. If a surgical resident is in the hospital 24-hours a day, then the attending surgeon can take call from outside the hospital but must be able to respond within 15 minutes. There must also be an anesthesiologist and full OR staff available in the hospital 24-hours a day as well as a critical care physician 24-hours a day. If anesthesia residents or CRNAs are take in-hospital night call, an attending anesthesiologist must be available from home within 30 minutes. There must also be immediate availability of an orthopedic surgeon, neurosurgeon, radiologist, plastic surgeon, and oral/maxillofacial surgeon. There must be > 1,200 trauma admissions per year. The key physician liaisons to the trauma program (trauma surgeon, emergency medicine physician, neurosurgeon, orthopedic surgeon, critical care physician) must all do at least 16 hours of trauma-related CME per year. These centers must participate in research and have at least 20 publications per year. A level II trauma center also has 24-hour coverage by an in-hospital general/trauma surgeon as well as an anesthesiologist. There are several minor differences between a level I and II trauma center but the main difference is that the level II trauma center does not have the research and publication requirements of a level I trauma center. A level III trauma center does not require an in-hospital general/trauma surgeon 24-hours a day but a surgeon must be on-call and able to come into the hospital within 30 minutes of being called. Anesthesia and OR staff are also not required to be in the hospital 24-hours a day but must also be available within 30 minutes. Level III centers must have transfer arrangements so that trauma patients requiring services not available at the hospital can be transferred to a level II or III trauma center. Patients with fall-related injuries and fractures are generally a large percentage of the trauma population cared for at level III trauma centers. 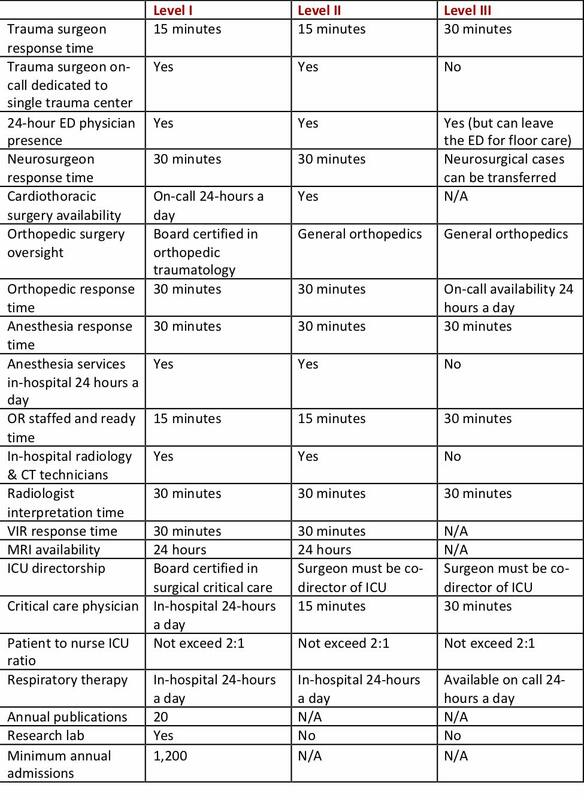 The American College of Surgeons oversees the verification of hospitals as meeting the requirements for level I, II, or III trauma center and the entire document of requirements is 30 pages long but the key differences are summarized in the table below. A key element of level I and II trauma centers is the ability to manage the most complex trauma patients with a spectrum of surgical specialists including orthopedic surgery, neurosurgery, cardiac surgery, thoracic surgery, vascular surgery, hand surgery, microvascular surgery, plastic surgery, obstetric & gynecologic surgery, ophthalmology, otolaryngology, and urology. In addition, level I and II trauma centers must have a spectrum of medical specialists including cardiology, internal medicine, gastroenterology, infectious disease, pulmonary medicine, and nephrology. Level III trauma centers do not have as extensive requirements for specialists on-staff and only require general surgery, orthopedic surgery and internal medicine. Here in Ohio, we have 12 level I trauma centers, 10 level II trauma centers, and 20 level III trauma centers. In addition, we have 3 level I pediatric trauma centers and 5 level II pediatric trauma centers (not shown). The location of Ohio’s trauma centers means that most Ohioans live within 25 miles of a level I, II, or III trauma center hospital. And all Ohioans live within 60 miles of a trauma center (when including trauma centers located in our bordering states). So, what does this mean for the individual person who has suffered a traumatic injury? Most patients will not perceive much difference between a level I and level II trauma center; both will have emergency medicine physicians, general surgeons, and anesthesia services immediately available within 15 minutes, 24-hours a day. From the patient’s viewpoint, the main difference between a level III trauma center and a level I/II trauma center, is that these services will be available within 30 minutes rather than 15 minutes. If a patient has injuries that require a surgical specialist such as a neurosurgeon, cardiothoracic surgeon, oral-maxillofacial surgeon, or plastic surgeon, then that patent may require transfer from a level III trauma center to a level I or II trauma center after initial stabilization, depending on the availability of surgical specialists at that particular hospital. If the trauma injury is orthopedic in nature, then the response time by an orthopedic surgeon is going to be similar, whether it is a level I, II, or III trauma center – the majority of fractures require repair within 24 hours but not within minutes of arrival in the emergency department. With orthopedic injuries, the main difference will be that more complex injuries (such as an extensive pelvic fractures) will be best managed at a level I trauma center where there is a fellowship-trained orthopedic traumatologist available. For nearly all trauma patients, the most important factors that dictate survival are the initial assessment of the injury and initial resuscitation with fluids and blood transfusions that occurs in the emergency department. Therefore, getting to the closest trauma center of any kind should be the priority for the severely injured trauma patient – if a level II trauma center is an extra 20-minute drive further than a level III trauma center, then the patient is better off stopping at the level III trauma center.